Gone are the days of guessing how much you can eat or cook with based on the weight of a package. 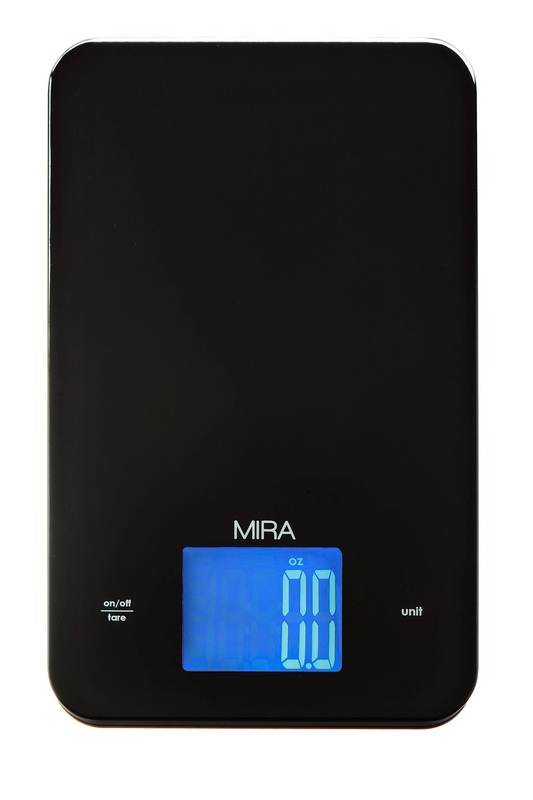 Collecting an accurate weight for your food is now easier than ever with the MIRA Glass Digital Kitchen Scale. With it's large back-lit digital display that can be changed from ounces, pounds, kilograms, and ounces - you'll never have to guess again! The MIRA Glass Digital Kitchen Scale weights up to 11 pounds, and it's beautiful tempered glass surface is four times stronger than regular glass. The glass easily wipes clean, and the slim sleek design of the scale itself fits easily into small spaces in your kitchen, taking up little to no extra room (really great in small kitchens were space is already so precious). Our MIRA Glass Digital Kitchen Scale worked beautifully. It came with batteries (3 AAA) so we were able to start using it immediately. This scale also comes with a two year warranty, so we didn't need to worry if we accidentally left it out and it was found by tiny fingers. Not only did this scale work great for portioning out snacks and finding correct weights for baking, but it also worked in a pinch as a postal scale for shipping packages from home. You can find more information, and purchase this scale for yourself, on Amazon.